The morale of this story is BACK UP !!! Hardware will fail at some point, and we never know what Mother Nature has in store for us, so our only protection is to back up our data on a daily basis. Everything else is replaceable. We will NOT be responsible for lost data, and we will not be responsible for not backing up! This is your responsibility, but we will answer any questions and provide all expertise to guide you in this task! Backing up the data on the server is critical to the success of the hospital and to maintaining your sanity. It's simply a matter of time before your server will fail, and when it happens, you are left with only the data backup. Backing up is a simple process that takes 5-15 minutes (depending on the amount of data) at the end of each day. Please do it! Online Backup, configured properly, is the BEST solution for data protection, but does require a decent broadband internet connect at the hospital. We can setup and manage the online backup of your hospital's critical data. With this service, we monitor successful backups and check for restoration integrity, so you can concentrate on your hospital. Though a back-up can be done at anytime, it's best to back up at the end of the day, after running PROCESS DAILY. Also backing up before the beginning of morning hours is also a good time. It's important to back up when no one is using the system. Close the management system at all stations. If a station is accessing the data during a back up, that data will be excluded. 24-hour hospitals should purchase sophisticated backup software that will allow for "open-file" shadow copying, so backups can be done anytime. The data backup should be taken off-site each evening. It is your responsibility to verify the backup periodically. Your data in the Animal Hospital Management System is mission critical, and must be protected using the most advanced, secure and reliable backup strategy available, using Online Backup by MozyPro. Click here to learn about online backup and why it's the only way to be sure your data is protected. 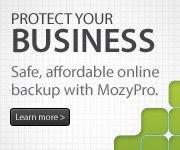 Contact us to install and configure MozyPro Online Backup Client! Once configured, it's simple to back up using the Zip or Jaz drive. 1. Verify that the management system is closed at all stations. 2. Go to START, click on 1-Step Backup or double-click on the 1-Step Backup on the desktop. 4. Follow the simple on-screen commands. It's necessary to configure the backup process the first time it's used and if the previous backup job failed or the current disk was lost. 1. For Zip drives: Go to START, click on 1-Step Backup or double-click on the 1-Step Backup on the desktop. For Jaz drives: Go to START->PROGRAMS->IOMEGA TOOLS, click on 1-Step Backup Properties. 3. Verify "Create New Backup Job" is selected. 4. Click on the FILE SELECTION tab. The C: drive in this example must be the hard drive on the Server! 7. Proceed with the backup. Online backup is the best solution for protecting your data. For hospitals that do not have adequate broadband internet access, we have found the Zip and Rev systems to be fast and reliable for backing up data, but there are many other systems (Tape Drives, CD-RW, RAID) that are up to the task. Contact us by e-mail with your particular system, and we will endeavor to add instructions on this page. REMEMBER, PLEASE BACK UP YOUR DATA ON A DAILY BASIS !! !